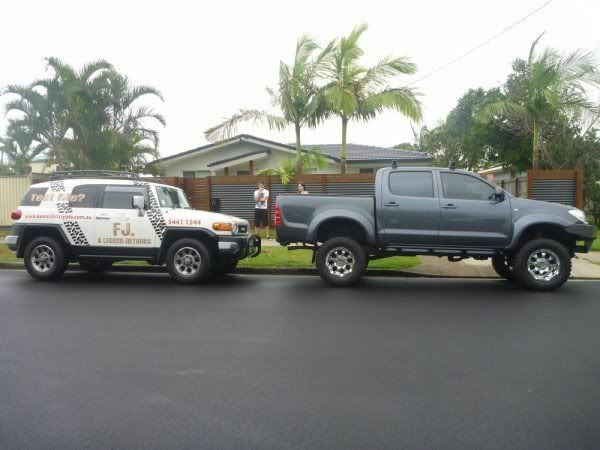 Hey fellas see there is a few of ya's with the FJ cruisers wondering what your thoughts are on them? Haven't seen one yet on the run, but man they must fly for such a relatively small car with a prado V6 petrol. Can anyone comment yet. I am still considering one for my next get around 4WD. Massaged to fit 35s and flex very nicely. One has been fitted with gas and another is playing with some airflow mods. Seem to be very nice trucks, as pointed out prado base so solid point to work off but bit lighter. Only complaints are probably a little hard to see out of in places and might not be as spacious if you are trying to carry lots of people and gear..
A Prado with an individual body shape. Ugly as sin in my opinion. But they no doubt would go very well with that 4L V6 under the hood! Here in Adelaide I have only seen 1 or 2 on the road since their release so I imagine that they are not selling very well? I think they are selling at a reasonable rate however they are more suited to couples rather than families I would think. Ordered mine a few weeks ago. The dealer here said they have averaged selling 5 a month since they come out. I drove one for a weekend. Performance was similar to my lux really (same motor, but lux manual, FJ auto). It did seem a little doey down lower, but that could just be the auto. If you get into it they move along pretty good. Got my fj in June 2011. Done 20000klm. I never had a 4x4 so can't compare. Haven't really done much 4x4 driving but bog stock I took it down cowley link track in the otways and it was up for it no problem. I was actually told I'm nuts taken it down this trk but it went through it easy as. Best thing is it drives like a car on asphalt and it goes hard in the bush. Great car. Heaps of room in the back for adult passengers. They can't import them fast enough. Check out car sales.com. If I sell mine now I'd get what I paid for it. Looks like it ticks every box if u ask me. I am keen to get my hands on an FJ and hopefully work will spring for one as they cost the same as my current company car. I am a little hesitant with the roominess is all. Have had a good look inside one and to me it seems as spacious as my current drive (Kluger) but it actually seems to have a proper 3 row rear seat. I have 3 kids who come and go but we do like to get out and about when they are with their dad. I agree with them selling well though.....I travel southern Qld pretty solidly for work and see heaps on the road. I just want to get a decent 4x4 again as my last job supplied Hilux Dually and I miss being able to hit the beach, not get bogged on farms while working and just having a bash with my mates. Any wisdom would be appreciated. Personally I don't like them. I'm not that big on retro looking new models, or resurrecting older models. Bit like the PT Cruiser, looks bad, goes bad, interior is bad. But people will continue to buy it because it's a Toyota. These guys are doing some trick looking systems!! !